Hair Loss Prevention. Thinning Hair Remedies. At InVisions of Connecticut , we are very proud to provide each of our clients with the very latest advances in hair replacement technology and clinically proven male and female hair loss solutions, Hair Loss prevention and Custom Hair Replacement solutions. InVisions of Connecticut is a recognized leader in multi-therapeutic hair loss treatment, hair restoration and hair replacement for men and women suffering from Alopecia, balding, and thinning hair. When most people think about thinning hair or hair loss, typically it involves men. 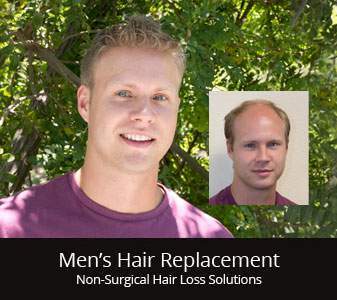 Over the past couple of decades the advances in men’s hair replacement have changed enormously. Today’s technology produces materials that give you a comfort that was never seen of before. Men’s hair replacements today are made from real human hair that is matched to your existing hair color and texture. You may have seen movie stars, neighbors or even that person what works out at the gym who have a hair replacement but because of the techniques, materials and high quality hair you can’t tell even when you are up close. Men’s Hair Replacement Connecticut. If you are a man experiencing thinning hair or male hair loss and live in Connecticut or the surrounding area, our specialists are here for you. For more than 25 years, InVisions of Connecticut has been helping women as well as men restore their hair, their self-confidence, and their lives. At InVisions, we offer every proven hair loss treatment and non-surgical hair replacement solutions to help you restore your hair, your life and your style! PROVEN HAIR LOSS SOLUTIONS: At InVisions of Connecticut, we have helped thousands of Middlebury, Connecticut area men, women and children suffering from hair loss, baldness, and thinning hair. InVisions of Connecticut in Middlebury has taken great pride in providing our clients with the very latest breakthroughs in male and female hair loss prevention programs and non-surgical hair replacement solutions for all types of hair loss. 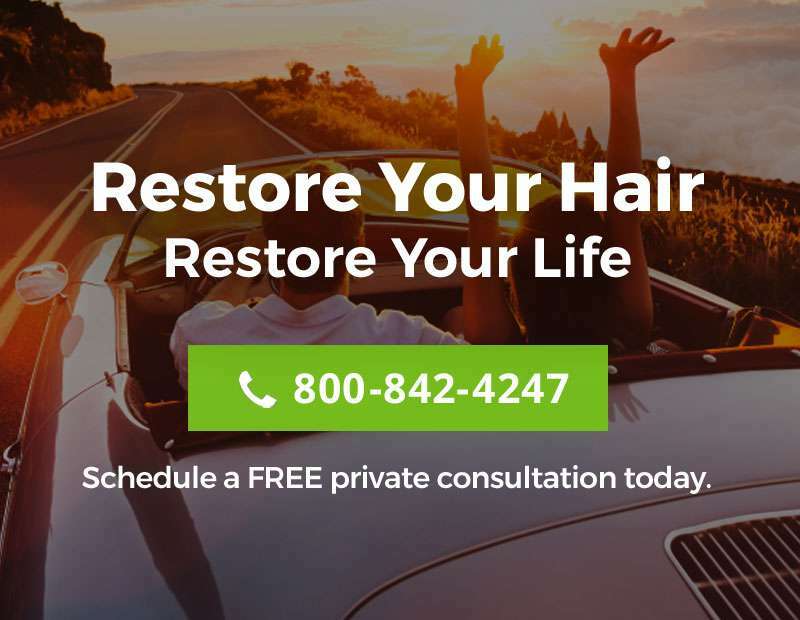 InVisions Hair Replacement Connecticut offers discreet, private, dignified, confidential services by our team of quality trained and experienced hair restoration specialists. We provide professional, one-on-one personalized service, totally private styling rooms for both men and women, and private, off-street parking. At InVisions of Connecticut, we believe in educating clients in simple, easy to understand terms about the causes and treatment options for your specific type of hair loss. Each of our procedures is individually designed for your specific needs, lifestyle and expectations. Whether you are just starting to experience balding or are in most advanced stages of hair loss, we can help with our full spectrum of professional options. An initial private consultation provides the perfect opportunity for you to meet with a trained professional about your hair loss, visit our facility, and have a complete hair and scalp evaluation. This also provides you with the opportunity to ask questions and receive thorough, detailed answers about your hair loss, address your concerns and determine which hair loss treatment or hair replacement options are right for you. If you or someone you know is suffering from hair loss, alopecia, or thinning hair, we encourage you to contact us today. We will work one-on-one with you to address all your hair loss concerns and help you find your perfect hair loss solution. Do you suffer from hair loss or thinning hair? Hair loss can be caused by a variety of factors, both genetic and medical. Our quick and easy online hair restoration test only takes a few moments and gives our specialists enough information to begin to assess whether non-surgical hair replacement or hair loss treatments may be right for you. 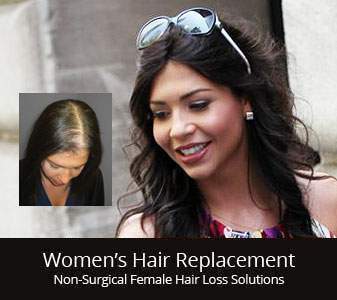 Invisions Hair Replacement Connecticut creates customized hair loss programs for every client and helps both women and men. Simply choose the appropriate test above to get started. I recently visited In Visions of CT in hopes of finding a solution to my recent hair loss. The staff was great, I was greeted warmly by the girls at the front desk and was offered a beverage before heading to a comfortable private room. 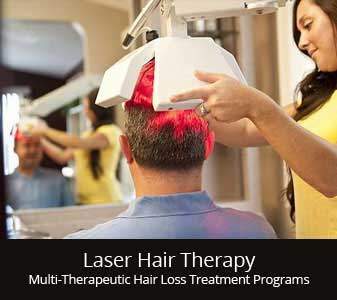 The clinician Lew was great, he explained to me that the cool laser light therapy would be the best solution to my hair loss. I cant wait to start the laser and see results! Started then switched during the program to another facility in Rocky Hill, CT that offers the same services specifically because I've zero tolerance for people in business who have anger issues. Worked with Jeff the main Rep who was very professional and courteous throughout however one woman who claimed to be one of the owners is not customer oriented with the anger issue mentioned and too uptight to be working with the public and shouldn't be. Although very satisfied with the Hair Treatment program and would recommend Invisions, felt a responsibility to post my review. The owner Lou and his Daughter who worked the front desk most days were both always very pleasant and professional - A special thanks to Jeff, you were great !. I’ve been a client at Invisions since 2014. Losing your hair as a woman, especially a young woman, has been a struggle, but the staff at Invisions has been incredibly supportive and flexible with my schedule. Jeff and Lou are amazing to work with! The front desk ladies are pleasant and very friendly.– Brittny S.
if I knew about this company before I wasted money on other treatments then I would I have a lot more money in my account. They treat you like family & they listen to what you want INSTEAD of these other company’s just do what they want & leave unsatisfied but Not at Invisions of Connecticut.– Anthony L.
InVisions Hair Loss Restoration and Replacement Middlebury, Connecticut has been in business for over 25 years, offering men and women across the Waterbury, Hartford, Danbury, and New Haven, Connecticut region the latest, most natural hair loss solutions, hair replacements, hair restoration procedures, wigs and hair loss treatments. What Are The Main Causes Of Hair Loss For Men And Women?